Mutant Abilities: Advanced energy manipulation that allows his body to absorb certain types of electromagnetic energy, metabolize it, and release it in a concentrated beam of force that he can direct with his eyes. Due to injuries sustained in the past, he is unable control these beams fully and has to use protective glasses made of ruby quartz to keep the beams in check. A special visor is often used to help him focus and manipulate his blasts in various, controlled ways. History: Scott Summers was the first and oldest born in Anchorage Alaska to Katherine and Christopher Summers. The latest in a long line of soldiers, Scott and his younger brother Alex grew up around the ridged military environment of Elmendorf Air Force Base. His father, a highly regarded Major, was a decorated fighter pilot whose skills put him on the short list to test some of the most advanced and secret aircrafts of the day. His mother, Katherine, was an equally decorated army doctor who was also part of advanced research in the military community. Growing up in this environment, Scott was immersed in the disciplined environment of the military and developed an early fascination with planes. His father often nurtured his curiosity while telling him stories about the long tradition the Summers family had as soldiers. He told his son about how the Summers family had a history of soldiers going back to the American Revolution. This instilled in him an early desire to be as decorated and honored as those that came before him. Scott was on the fast track to becoming such a soldier. He and Alex attended a special school for children of military officials. Even at a young age, he made a name for himself as being disciplined and respectful towards his superiors. He often wore a uniform to school and when others teased him, he would stand his ground. This caused some early tension between him and his brother, who was more a fighter than he was a disciplined soldier. Yet this tension didn’t stem Scott’s ambition or that of his brother. They both seemed intent on matching the standards set by their family. However, this ambition was abruptly sidetracked by a terrible tragedy that is surrounded by unusual circumstances. The details are somewhat sketchy, but when Scott was eight his mother and father scheduled an impromptu leave of absence from the base. Their reasons for doing so aren’t clear, but it is believed that his parents knew something that was potentially ground-breaking. Whatever it was, the secrets were lost. While on their way to New York City to visit a trusted old family friend, there was a mysterious accident and the plane crashed. Scott and Alex managed to escape via parachute, but Christopher and Katherine did not make it. They were declared dead and the boys were officially orphaned. After recovering from their injuries, the traumatized young boys were shipped to an orphanage in New York City. Christopher Summers's former superiors pulled strings to ensure they were kept in a special group home for the children of dead soldiers. Here they could still get some decent schooling and their chances at being adopted into a good home would be better. However, such chances were quickly stifled due to the lasting impacts of the plane crash. Both Scott and Alex underwent dramatic changes during their time at the orphanage. Scott became more closed off and emotionally reserved. While he privately mourned his lost, he publicly hid his feelings beneath a thick emotional shell that few cold get around. This turned off most potential parents. What turned them off even more was his protective behavior towards Alex. Unlike Scott, Alex vented more of his emotions. Most often, they came out in the form of aggression. It often forced Scott to shelter his brother, making it difficult for either one of them to get adopted. This difficulty was further compounded when Scott’s mutant powers manifested. Because of the physical and mental trauma Scott suffered, his powers manifested at an early age. They started as headaches that quickly escalated seizure-like symptoms. At age ten he started showing flashing red eyes to prospective parents. By age twelve these eyes turned into a source of destructive blasts, which ended up blowing holes through walls. His brother Alex, who was only three years younger, showed similar symptoms. The development of their powers not only scared off prospective foster parents, it left them isolated from the other children at the orphanage. It wasn't long before Scott and Alex were routinely picked on. It led to confrontations that often resulted in their powers flaring up. After repeated abuse and a few failed foster families, things eventually came to a head when an unfortunate flare in Scott’s powers caused so much damage to the orphanage that a number of officials wanted him and Alex transferred to another facility. Not liking this prospect one bit, Scott and Alex struck out on their own and for a time lived on the streets. It was a harsh world, but Scott's disciplined nature helped him survive and protect his brother. They eventually met up with a local gang of other orphans who were in difficult situations of their own and willing to overlook his mutant status if it could help them. With this gang, Scott got his first taste of leadership. In this, he excelled. By age 14, he was leading his gang on numerous operations to obtain food and resources. His powers quickly went from an obstacle to a resource. Both he and Alex were held in high regard. While Alex embraced this renegade style existence, Scott remained focused on greater ambitions. He expressed a strong desire to rebuild a life that wasn’t on the streets. This put him at odds with his group and his brother. This wedge only widened after a horrific incident in a simple operation to gather food from a truck. In it, the driver of the truck tried to attack Alex and Scott responded by blasting him with his optic blasts. This resulted in the driver being killed. It struck Scott on a profound level, so much so that he resisted using his powers. In repressing them, he made them more unmanageable. By age 15, he was fully blinded and had to cover his eyes at all time. This not only hindered his ability to survive, it hindered his ability to protect Alex. Eventually, Professor Charles Xavier discovered him. He was given a chance to join a new school for mutants. It was a chance to get off the streets and into a better life. While Xavier offered the position to both Scott and Alex, only Scott accepted. This solidified the wedge between Scott and Alex, separating the brothers and sending them on different paths. While Alex remained with the gang, Scott became one of the first students of the Xavier Institute for Higher Learning. There he would later embrace his role with the X-men, working hard in the classroom and in training to manage his powers. 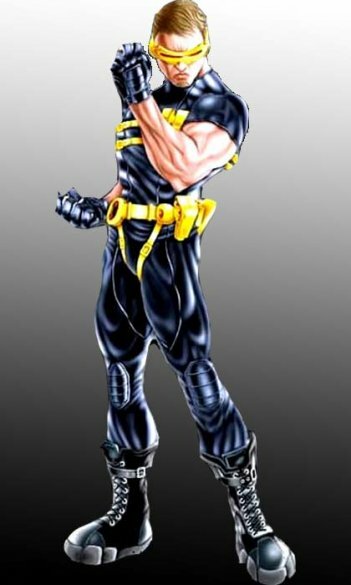 He learned under former marine, John Proudstar, and was part of the X-men’s initial mission as masked vigilantes. During this time, he was still emotionally reserved. However, he did develop a close friendship with Jean Grey, which quickly deepened as time went on. He eventually became the field leader of the X-men and is one of Xavier's most trusted and loyal students. Despite clashes with teammates such as Wolverine, he earned respect from each of his peers and is steadfast in his dedication to the X-men. Character Breakdown: The mental makeup of Scott Summers has many major influences. Being born into a family of soldiers already pre-disposes him to someone who can fight, strategize, and lead. It also pre-disposes him to favor discipline and loyalty more strongly. It has the effect of giving him a ridged, often stoic personality. Having looked up to his parents and ancestors as soldiers, he too strives for those kinds of qualities and is more likely to gravitate towards solider-like tendencies. Going along with this is the important role that control has in his psyche. Scott Summers is plagued both physically and emotionally by a lack of control. In a purely physical sense he is at the mercy of his powers, which he cannot turn off. If he is unable to control these powers, the people around him get hurt. Having already lost so many of his loved ones, he is very cautious about protecting what family he has left. This leaves him vulnerable to punishing himself for his failures and being overprotective at times. But beyond the physical aspects of control, the emotional control is often just as serious. Growing up he was already influenced by the military to restrain and discipline emotions, but seeing his parents die in a plane crash pushed those emotions to limits his young mind couldn't handle. So growing up he has to deal with chaotic emotions that he doesn't always understand and has difficulty expressing. So normal acts like showing affection to someone he cares about and seeking intimate relationships are much more difficult. In the end, what guides Scott the most is his extraordinary discipline. Even though he struggles with control, his sense of duty and discipline hold him together personality wise. This along with the military influences in his early life make him a perfect fit for the types of duties the X-men carry out. Working as a unit and going on missions is just like being a soldier to him and the cause he's fighting for is a cause he truly believes in. Between discipline and control, Scott Summers has a psyche that is ordered and structured. Sometimes it is ordered to a fault, but he is able to make up for these faults with the morals and guidance instilled in him by Professor Charles Xavier and the X-men.